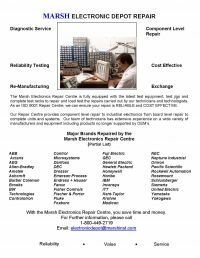 MARSH provides design, build and reverse engineering of Obsolete Electronic Products and Circuit Boards regardless of quantity required, to provide product life extensions for electronic items no longer supported by the OEM. Our Quality Management System (ISO 9001: 2008 & CSA Z299.2:1985) guides each stage of the reverse engineering process, ultimately ensuring the customer of a quality produced final product. From design review, material procurement, final assembly and through rigorous testing, our highly skilled / trained technical staff and production personnel will make sure your reverse engineered product is completed on time, budget and to exacting specifications. Whether unique one offers single piece production or multiple unit production, Marsh can accommodate your reverse engineering product requirements, and help you reach your goal of extended in-service life, at a reasonable cost.